There are some places you visit once and remember for a long time. 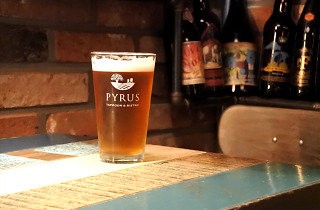 The Pyrus Taproom & Bistro located in Itaewon is one of those places. A must-visit for a smooth introduction into the Seoul craft beer scene, the casual tap room is headed by Lee Inho, one of Seoul's innovative cerevisaphiles that have led the movement to promote craft beer diversity in a relatively homogenous market. This no-frills bar and restaurant celebrated its 3rd anniversary this May, a testament to the quality of the beer and food you’ll find here. One of the things that set Pyrus apart from competitors is its exclusive seasonal beers. In the spring, they offer ‘Spring Rain IPL’, a lager with subtle notes of tropical fruits such as papaya, pineapple, mango and a hint of citrus. During the summer, the ‘One More Pils’ offers a refreshing take on the classic German pilsner by taking inspiration from the crisper pilsners made in Portland, Oregon. As the name suggests, one sip of this “Americanized German pilsner” will easily have you calling out for just “one more”. If you’re not a fan of pilsner, there’s always the ‘Sunshine IPA’ for more of a fruity taste. In the fall (which seems so far away in this heat), the ‘(Rye) Brown Ale’ has a deep roasted-flavor from a combination of nuts and coffee. Finally, the ‘Cacao Stout’ is the perfect beer for the winter with its fragrant vanilla coffee bean notes. Aside from these seasonal varieties, you can also find many signature beers as well as imported tap and bottle selections. As the ‘Bistro’ part of the name suggests, the food is also not to be missed. Whether you are a beer enthusiast or not, you can enjoy the signature pizzas and pastas, as well as a variety of other lighter fare to pair with each of the beer offerings. Pyrus also hosts beer pairing and barbeque events throughout the year, which you can find out through its social media. The best part about all of this is that you can enjoy the beers in the comfort of your own home. 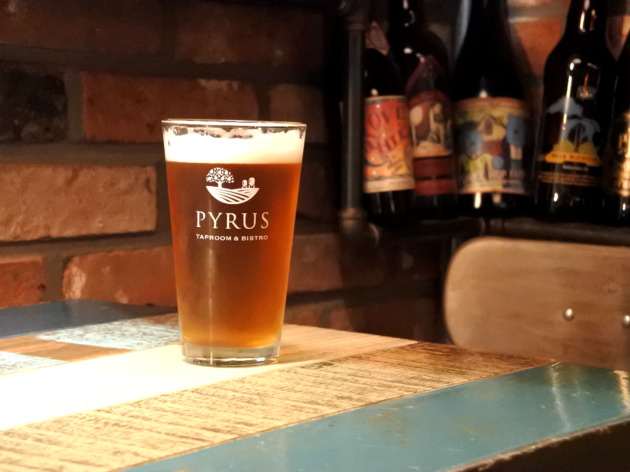 Pyrus offers a take-out service for all its beers, in part because of the short lifespan of the craft beers after they are taken out of storage. You can be sure to find affordable, quality selections here for your next dinner party. While Pyrus Taproom & Bistro currently outsources its production, Lee plans on building its own brewery in the near future. In fact, Lee travels at least once a year to breweries and taprooms all over Portland, Oregon, “tasting more beer than recommended” each day. At least there’s no better place for beer tasting than Portland, which is aptly named the world’s best beer city with the most breweries and brewpubs than any other place. Lee hopes to take his ‘research’ to create the next generation of craft beers in his own brewery. Noksapyeong Station (Line 6), Exit 3, 4-minute walk; Itaewon Station (Line 6), Exit 4, 6-minute walk.